These overhead photos of Maiden, North Carolina, data center — captured last month — show Apple’s $1 billion data center and two adjacent areas where Apple has started new construction. Rumors have suggested that Apple is building a second data center beside the first, but judging from these photos — and county building permits — it appears that this is not the case. In all likelihood, the two construction areas will house the new-age biogas fuel cell plant and the massive solar array Apple will use to help power the original facility. The Maiden data center is home to Apple’s iCloud service, a way for consumers and businesses to store files, photos, and other data on the web and use it across a wide array of devices. 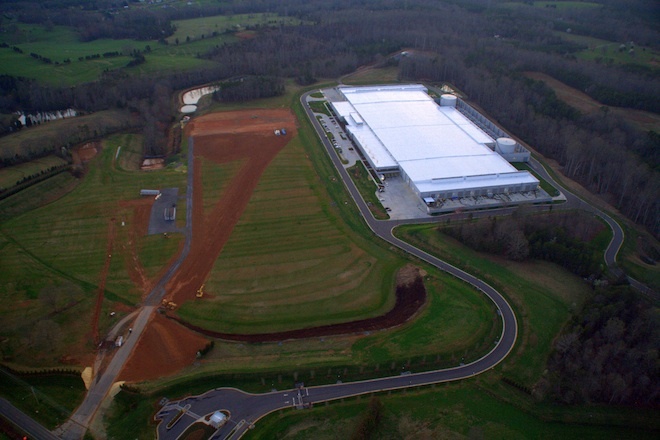 The data facility itself cost $500 million, but Apple has pledged to spend $1 billion on the site over the next decade. Opened for business around the beginning of the year, the Maiden center is just one of the many custom-designed data centers the giants of the web are building to supply their ever-growing array of web services. Google has built several of its own dedicated data centers across the world, and the likes of Microsoft, Facebook, and Yahoo aren’t far behind.